Wow, it's been 2 months since I bogged last. Yikes!! A lot has happened since then. Here is just a few. It's already late and I work in the morning. (hissssss) I will do the rest in a couple of days. Enjoy. Earlier this month we found out the Aaron is iron deficient. This is not a terrible thing, however here is my frustration with the whole thing. 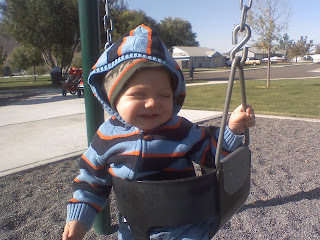 Ever since Aaron was, well basically when I was pregnant with him I knew he was a very active boy. I remember making comments at work "I'm having an ADHD baby," very jokingly of course. And those of you who had the pleasure of seeing this while I was pregnant remember my belly could have caused an earthquake with how much he moved. It was very uncomfortable. To this day he hasn't stopped moving. At a young(er) age I brought this up to his doctor, who said, "Yes, he does have a lot of energy, but let's wait until he gets to at least four to see how this goes." So, I waited. When he started having sleep disturbances, I waited. When he had restless leg syndrome, I waited. When he had sleep apnea, I had his tonsils and adenoids taken out. I tried changing his diet. I used the cookbook by Jerry Seinfeld's wife, "Deceptively Delicious." It gives fabulous recipes on how to sneak vegetables in everyday cooking. It's a great book. I bought things sugar free and with no preservatives or red dye, because they can increase hyperactivity. When I did all that, on a scale from 1 - 10, he went from a 10 to 9.5. I waited. At his 4 year old check-up I brought it up again. His doctor, who previously up to this point never hinted a thing, flat out said, "oh yeah, he has ADHD and it's one of the most severe we see in the office." I about hit the floor. I mean, was I surprised? Not a chance, but this whole time making me feel like an idiot mother who is trying to over diagnose her kid. He handed me a prescription and told me he wants to follow up in a month. I cried the whole way home. Not from saddens, but from frustration. After a long talk with Charlie we decided to try the medication for Aaron for a month. If it works, great. If we see anything that makes him not be his adorable, sweet self, we take him off. A month goes by and no change. Zip, nada, nadia, nothing. I do notice that it seems like his sleeps apnea is coming back though. At the follow up we decide to take him off and wait (again.) I'm okay with that. I just happen to mention about the sleep apnea and restless leg syndrome when he sleeps and he orders an iron panel. The results...no surprise, low. We had to start him on an iron supplement just like his little brother. That night I started to research iron deficiency and signs and symptoms and guess what I found. It is linked to restless syndrome, sleep apnea, irritability and with more research some doctor's are trying to link it to ADHD. I couldn't believe it. Now, I am not holding my breath. But, if that was his issue the whole time, low iron, that's the easiest fix I could ever imagine. We haven't seen any really big changes yet and we might not ever, (which I am fine with, I've learned to deal)but I will just say that for the last 2 weeks we have been able to put him bed, say goodnight and walk out. He stays in bed and falls asleep. (knock on wood) We have never been able to do that! It's wonderful. Thanksgiving had really mixed emotions for me. My Mom's Dad passed away the Monday before. We all knew that his health was failing over the last few years and this was quite expected, but it was a lot harder for me than I thought it would be. My Granddad and I were very close. He was the most amazing man I have ever known. He was very intelligent too. I mean, the man could read and write Hebrew. I learned a few things about him that I never knew before. He was in the Navy during WWII. What was really touching was that he had a full Military burial. If you have ever been to one you know what I'm talking about. It is really emotional. I balled, especially when they presented the flag to my Grandmother. It was a beautiful funeral. I think the hardest thing is that my granddad and I shared the same birth date. Ever since I could remember we would have contests to see who could call who first. I know something will be missing this birthday. The positive side to his passing is that it brought families together. This was the first time in 3 years that my siblings and I were all together. We did miss a few spouses though. Since my brother and kids came from back East all the cousins where able to cause major havoc together in my mom's house. It was quite entertaining. Also, my sister even volunteered to watch our boy's so we could have a night off. THANK YOU CINDY!! Even though we were gone for less than 9 hours it was refreshing. Here are some pictures of everyone at my Mom's house after the service. We had a good trip, but were very thankful to be home. My mom thought that it would be fun for the grandkids to help decorate her tree. She was right. As soon as they saw uncle Scott and Uncle Dave setting it up their faces lit up. Julia, Maddie, Aaron and Adam. Halloween was a lot of fun. We went to my friend's house just down the street, ate some fabulous food, went trick-or-treating around our neighborhood for a few hours and then went back and ate Cinnabons..mmmmmmm. We talked for a little while longer and then when home and let the kids crash. It was quite the adventure. I guess I got so caught up in the sugar rush and forgot to take many pictures. In fact, I only took one. He makes a very scary Darth Vader, right?!? You can almost hear the Darth Vader theme going off in your head right now. Aaron had the most fun. He was Spiderman. He and his two little buddies were running house to house. It wore him out. Despite of all the candy he went to bed quite easily that night. Who knew? Charlie and I took the kids to a really cool pumpkin patch yesterday and had a lot of fun. For only $6/person we got to take a hayride to the pumpkin patch and pick out one pumpkin per person, go through the hay bale maze, climb the straw bale pyramid and go to the petting zoo. For how much fun Aaron had it was worth every penny. He kept saying, "I love hay rides" over and over. This was our first trip to a pumpkin patch ever. I think we found a hit and will have to do it every year. We will carve the pumpkins tonight on Halloween eve!! ps: I huge Thank you to Kelly for introducing me to slide.com!! The previous slide show program I used was terrible to work with and was soooo slow! Hence why I NEVER used it. It was so easy and quick this time! THANK YOU KELLY!! Happy 1st Birthday Wyatt!! I can't believe that it's been a year since that unforgettable day. It has been a huge roller coaster ride ever since, but I am so grateful that he's here and, amazingly enough, healthy as a little horse. I am eternally grateful for the spirit guiding me to the hospital that day and the support we have gotten throughout this past year. We couldn't have done it alone. A few hours after birth. He was kept cold at 88* for 3 days after birth. Hypothermia therapy saved his brain!! We love you Bug! You are our little miracle and are so blessed to have you with us! Happy Birthday Wyatt! Today Charlie got his wisdom teeth out. We were both very nervous for it just because we knew one tooth was pretty bad and also the fact that he's 33 years old and still has his wisdom teeth. We had to put both kids is daycare so I could stay at the office and then take care of him until he got coherent enough. We arrived at the oral surgeon's at 10:20am and they were waiting for him. What was really nice was the fact that the nurses there were gals I graduated with from the nursing program 5 years ago. So I felt better instantly. Charlie, not so much. He started to relax after the laughing gas. He was hilarious on that stuff. He was a chatty Kathy. Then they put him under and they scooted me out. About an hour later Dr. Klein came out and was thanking us for getting the CT of his teeth. Apparently, his bottom right tooth had 3 roots and were all wrapping around the nerve. The CT was able to show where the nerve was, so the oral surgeon was able to extract the tooth without any complications! Hooray. Charlie is doing amazingly well. Hardly any pain or swelling yet. His mouth is still a little numb and he's on a lot of medicine. Hopefully he continues to heal this good!! I know this might be disgusting to some, but I had to show his tooth. This one was the only one that came out intact and I can't believe the root. No wonder wisdom teeth hurt!!! Saturday the 18th we had the boys' birthday party. I let Aaron choose the theme this year and who would have guessed..... MONSTER TRUCKS!!! Aaron has been waiting for this party since August. Friday night Charlie put together Aaron's big gift from us, his own personal monster truck. Well, a power wheel actually, but he calls it his monster truck. I thought that I was being so creative by hiding it in our laundry room, putting blankets and clothes all over it so it would look like a big pile of laundry. Saturday morning he walking right in the laundry room, threw off the clothes and blankets and shouted, "Momma, I want to drive my car." "What car Aaron?" I asked like I knew nothing. "My big. black monster truck." It's pretty sad when your 4 year old out smarts you! The party was fun. We had a bounce house, tattoo booth called 'Hill Ink" (thanks Mark for the sign!) and a slide show of the last year. All in all it turned out to be a good party. Since I made the cake for Aaron's 1st birthday I thought I would attempt for Wyatt's too. It's definitely a homemade cake! Wyatt seemed to love it though!! Aaron and his monster truck. 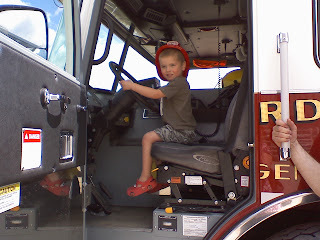 He was so good about sharing and letting other kids ride in it or drive it. I was really impressed by him that day!! All the kids wanted to help open gifts. It was so crazy. I still don't know who got what from who. But the kids enjoyed it and that's all that matters!! I just love this picture because of Wyatt's curls!! He's so darn cute!! Aaron got so many truck toys. He really didn't care about anything else. He would just smile at the other gifts and then continue trying to open the truck boxes. Crazy kid! Today Aaron Jacob turned 4 years old. I can't believe it. He is starting to look more and more like a little man these days. This morning when he woke up he asked with a huge smile on his face, "Today's my birthday, Momma?" (If he calls me Momma forever I will love it.) He wanted waffles for breakfast this morning so I made waffles. He got to watch any movie he wanted and we didn't get dressed til noon. It was great. When Charlie came home from work he brought an ice cream cake from DQ (yum!!). We sang "Happy Birthday," he opened one present (clothes, boring) and then we went to Eatza Pizza his favorite restaurant. It's like a small version of Chucky Cheeses. This kid always scores on the jackpots. He got 880 tickets. He turned them in for a ninja sword, a pen that lights up and one of those sticky hands that you fling at the table and it picks up a piece of paper. Cheap thrills....priceless. He had a great time. He was hard to calm down and wrestle to bed, but somehow Charlie was able to put him to sleep. He is really excited for his party on Saturday. With a monster truck theme who couldn't wait for that! Happy Birthday Aaron!!! Do to a unfortunate event the boys and I are heading to Utah for a few days. I am really torn about this since I am going without Charlie (he has to stay and work). I need to be there, but the drive will be very,very long. On the other hand since I will be there for awhile I would like to see everyone that I could. If you are available this weekend lets get together! It's been a long time since I've seen most of you! Drop me a message or give me a call and we'll go from there. Hope to see you soon!! Wyatt had his tubes placed this morning and did really well. We had to be at the surgery center at 6:45am. Since I have worked the last 4 days I was pretty exhausted. I didn't get up in time to get the kids ready, drop Aaron off at daycare and then go to the center. So, Aaron came with us and he thought that was pretty cool. He actually got to put stickers on Wyatt's hat and he loved that. They took him back at 7:45, they came and got me at about 7:55, and we were leaving by 8:00am. The doctor said there was really thick, sticky, mucus like fluid behind his eardrum and we'd probably see a huge improvement over time. Hooray, another hoop Wyatt has sailed through! This is the nurse taking him back. It's not the greatest picture because I took it with my phone. But, I think it captures the moment pretty well. 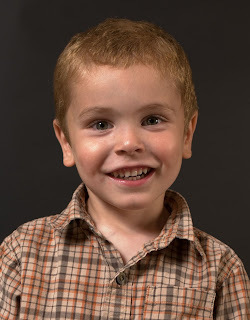 On Monday, Sept. 22, Wyatt is getting tubes in his ears to match Aaron. So, literally we will have 'tube'-ular boys. (I know it's a bad pun, but I worked 1/2 a night shift last night and didn't get home til 2am and then woke up at 6am when Charlie left for work and have been up ever since. I'm tired and everything sounds better when you're tired...right?) He has had 4 ear infections over about 5 months, still has fluid behind both ear drums and when they tested his ear drums there was no vibration. He responds to sound so I know he can hear, but it's probably like trying to hear underwater. I am all for them since I saw such a huge change with Aaron when he got his. I know that this will help him a lot. I just can't believe that since February both boys will have had surgery twice. And it's really scary when the doctor says"you're family's keeping me in business." This particular doctor has done all the surgeries too. However, it is safe to say that they were all greatly needed and none selective. I must say that we are completely blessed with fabulous medical insurance from Charlie's job!! ( my insurance is not so great to say the least.) Without his insurance, this past year when have cost a fortune!! One weekend in August we packed up the kids and headed to Seattle to take Aaron to see the Monster Jam monster trucks. Monster trucks are his favorite right now and we all needed a break and we thought this was the prefect excuse. What was also nice was that a couple of my certifications for work were expiring at the end of August. So, I just took the classes up in Seattle and my work paid for the whole trip (all except the monster trucks of course). We had a great time. This was our first trip as a family with no doctor appointments as the basis of our trip. It felt so good to just get out and enjoy ourselves. Aaron was so excited to see the monster trucks. We talked it up all week. He could barely wait. He now knows most of the trucks and some of the drivers now. It's pretty fun to watch him. Believe it or not, Wyatt really enjoyed it and he never pulled at the ear muffs!! These little guys were called the 'Quarter midgets.' They are 6 - 12 years old and were so stinking cute. Even though Aaron was exhausted we stayed for the whole show and neither of the boys fell asleep as the way back to the hotel. I was kinda shocked. I tried twice to upload a video clip of the show, but I guess it was too big because it didn't load, twice. It was fun though. A lot has happened in the month since I blogged last. It seems harder to find the time to update these days. The most important news was that we took Wyatt to the Children's Developmental Center mainly because he wasn't babbling. He had some speech sounds just not expressive speech yet. They also tested him developmentally. They used the 'Denver' and the 'Baily' test. And, of course the passed with flying colors. The only thing he was lacking in was speech. So now, starting this month we'll have a speech therapist come to our house to help me teach Wyatt and watch his growth. They mainly said that since he was struggling to breath with the tracheomalacia that speech went to the back burner. Which I can understand. Since that appointment he has now started to say "mmmmmmmmm." We are working on mama, but he just looks at me and smiles. I am just so happy that I can already see improvement, as small as it may be, it is still something. The fire season has started! Yesterday, Charlie got called to a fire with some co-workers and they have been there ever since. I think he'll be home sometime today, but we'll see. This is the first fire this season that he's gone to and has been away from us this long. 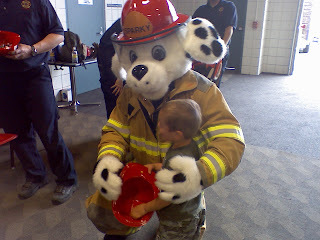 This is my only 2nd season as a fireman wife and it's getting a little easier. Last year he went to work on a Thursday and then couldn't come home until Sunday morning at 2am. That was really stressful considering I was 6 months pregnant. Regardless, it's always going to be a little scary for me. I have been a blogger slacker these days and I really don't have any excuse why. I guess life happens. Anyway, the last weekend in June every year here in the Tri-Cities is 'Cool Desert Night's.' People enter their classic cars and drive in a parade down a main street here and the whole city comes to watch it. It's a big three day event. Since Aaron LOVES cars and everything about them we knew we had to go this year. We picked a spot at the corner of the intersection and it was the best spot to see all the cars. Aaron loved every second of it! He even started likening the cars to the characters of the movie "Car's." He said, 'look mom, here comes Doc, Sheriff, and Lizzie.' It was really cute. He really enjoyed one car that blew fire out the tailpipe. The best part was that it was free. Got to love that part. I can't wait until Wyatt gets old enough to enjoy it too. 1. I was 8 years old. 2. I moved from El Paso, Tx to Leeds, Ut. 1. I graduated from High School. 2.I was working at Fiesta Family Fun Center in St. George Ut. 3. Moved to Cedar City, Ut to go to Southern Utah University in the Fall. 1. Married the love of my life, Charlie, here in Richland, Wa. 2. Finished my LPN year of nursing school, passed the boards, and started my career as a nurse. 3. I was thinking about getting pregnant. 1. My first son, Aaron, was 8 months old. 2. I was working as a RN at Kadlec. 3. I was getting ready for my family reunion in Park City, Ut. 1. We just found out we were having another boy. 2. I moved to Intermediate Care at Kadlec. 3. I was looking forward to not being pregnant anymore. 1. I had my last baby ever. 2. I have taken me or my kids to some kind of doctor more than I would like to count. 3. We bought a boat and love it. 1. Took the family out to eat for lunch with some friends. 2. Attempted to take a nap, but failed. 3. Watched the rain storm with Aaron. 1. Had a lazy morning. 1. Will clean my house from top to bottom. 2. Will dog sit Tucker and Melissa's 3 dogs. 3. Will go to the park with Aaron and Wyatt. 1. Will loose all the baby fat from both boys!!!!! 2. Will be dept free except our house. 3. Will buy land and start building our dream home. This week we did something completely out of our ordinary. We bought a boat. Charlie has always wanted one, but we could never afford one until now. We picked it up today and spent 4 hours on the river. It was amazing. The boys were really good, even better than I thought. Since I haven't got to name anything I decided to name the boat Priscilla. Charlie didn't like it at first but, it grew on him so I got my way. I am looking forward to a long, hot summer and I hate the heat!! I just thought this picture was sweet and had to share it. A few days ago I changed the batteries in many of the boys' toys and this one just grabbed their attention. Aaron plopped right down by Wyatt and started playing too. When I caught on to what was happening Aaron already put his arm around Wyatt's shoulder. It was really sweet. It's moments like this that remind me how much I love being a mom. There's no crying in baseball!!" "We didn't do it, Mom!!" Aaron had his surgery yesterday and did amazing. 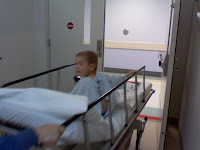 We had to be at the hospital at 7:00am and they wheeled him back by 8:00. I was a nervous wreck, but managed to stay cool. He was done by 8:30 and the doctor told us that his tonsils were HUGE. Not only were they blocking his throat but they were embedded far into his tissues too. Poor thing. No wonder he couldn't breathe. I got to go into the recovery room to be with him (it's nice when you work at the hospital, people pull strings for you). He woke up pretty sad, but he recovered really well. He was even able to eat (more like inhaled it) a PB & J sandwich (ouch, that makes me hurt just thinking it.) The hospital has pet therapy so he even got a visit from a dog. He really enjoyed that. We were able to go home by 3:00pm. He hasn't slept really well (can"t imagine why) but, we'll get through it. Thanks for all the prayers!! He is a strong boy! A little help from 'Transformers' toys Barricade and Optimus Prime. Every year the Hanford Site puts on a Expo all about safety. The Hanford site is huge on safety. So all the different companies out here get a booth and hand out free stuff. Hanford fire goes one step further and puts on the really intense show about how important it is to put on your set belt. There's this fake car crash and the ambulance and fire engines come and the kids love it. 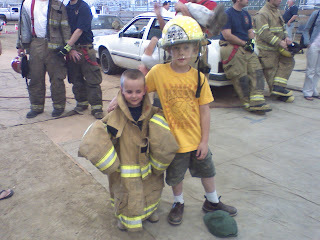 Afterwards they can go down and check out all the firemen gear and trucks. Needless to say Aaron has the time of his life. These two boys are Aaron"s good friends Kason and Jacob . 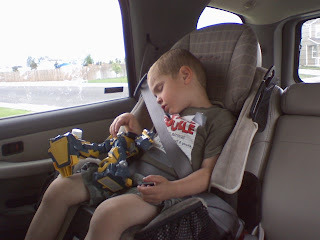 And once again he fell asleep on the way home.